Vinyl siding for your home has been around since the late 1950s, and is probably the most common cladding that is used in residential construction in the United States. It is a type of plastic protective covering which is made up of PVC, a polymer of vinyl chloride which is also used instead of rubber in electric cabling. About 80% of the weight of the vinyl siding is PVC resin, and the rest consists of various ingredients that make up the colour, gloss, flexibility and durability and resistance. Vinyl siding for your home can vary in thickness; the most common thickness used today is called builder’s grade and is about .40 mils, and the thinnest is about .10 mil of thickness. Thicker vinyls are more durable, do not sag as easily as the thinner ones, and are made to withstand winds of up to 180 miles per hour. There are many different types of Vinyl siding for your home, such as traditional vinyl siding, vinyl shake siding, vertical vinyl siding, cedar shake vinyl siding, brick vinyl siding, board and batten vinyl siding, vinyl shingle siding, vinyl lap siding, liquid vinyl siding, cedar vinyl siding, vinyl log siding, certified vinyl siding, wood vinyl siding and vinyl aluminium siding. This type of siding consists of 8-inch siding planks which are installed vertically. Cheaper than a wood such as cedar. Can be used to cover walls completely or as accent panels of siding. Cheaper than most types of siding and very minimum maintenance is required. It combines the elegant fresh look of traditional siding with a decorative groove on the top of the siding face. The groove makes the siding look more consistent than standard vinyl siding and gives it more strength. A richer look is created by the bevelled edge and the total look is one of traditional architecture and style. 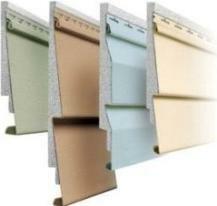 It is more rigid than regular siding, and quite durable. This siding is very popular with the green crowd as the fact that it does not emit the harmful chemical discharges that many other sidings do makes it eco-friendly. This type of siding is extremely effective in reflecting heat away from your home. This means that less needs to be spent on cooling the home, which makes it the perfect siding for warm-weather regions. It is available in a wide spectrum of colours and can be matched to your custom colour. It is virtually maintenance-free, as it has anti-static properties that makes it resist dirt and dust; a simple hose-off will keep it clean. It is vapour-permeable so eliminates growth of algae, mould or other spores. The material contains an elastic property which allows it to expand up to 645% and regain its original shape easily again. This means that there will be no cracks or splits. The energy efficient material has been recognised as an Energy Star partner by the Environmental Protection Agency. This is pre-ordered fire-resistant siding which comes on a roll. The seamless feature repels household pests and insects. Protects the house from water damage and provides great insulation. It is thicker than conventional siding and provides a clean, smooth and uniform exterior. It adds value to the cost of your property. This siding has a foam core which is laminated onto the back of the siding and interlocks when installed. The solid foam barrier this creates makes for excellent insulation of the home which results in a lower energy bill. This type of siding also provides a certain amount of soundproofing which creates a more peaceful and quieter home environment. Solid core siding protects the exterior of the home from air and water damage. It has a greater resistance to heat gain and loss than traditional vinyl siding. So much so that it has been awarded an Energy Star label. It is approximately 300% more impact resistant than traditional vinyl siding. Trim pieces can be added to corners, doors and windows to make it look even more attractive. Although he initial cost may be a bit higher, the long-term savings make this the most cost-effective vinyl siding. This siding will give your home the look of an original log-cabin. It can be used to replace or enhance logs on an existing home or applied to a new structure. Vinyl log siding is cost efficient and offers vey low maintenance. It does not need to be stained, sealed, have insect repellent applied or refinishing, and will not rot or splinter. There are many styles and colour options available. Trim pieces are available in a variety of designs. Easy installation saves on costs. Shake and shingle siding creates a wonderfully warm look. To create a unique look for your home you can use it in conjunction with other types of siding such as stone siding or brick siding. They come in a variety of shapes and sizes, patterns and various widths. They can be treated with fire retardant, painted or stained. 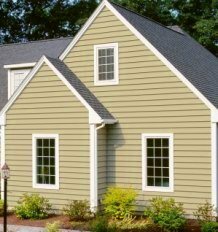 Why Use Vinyl Siding For Your Home? Whilst vinyl siding has received some bad press for being less recyclable than other types of siding, such as aluminium siding, it’s also less energy intensive. Initially there was no way to recycle used siding, which has caused a problem in the ecological sense, but this is fast changing as companies get on the bandwagon of creating more eco-friendly siding. Vinyl siding has become a firm favourite with Americans as it improves the look of the home and increases the value of it. It is also less costly than having to paint a home regularly to keep it looking good because of the protective layer and the durability of the vinyl. Cladding your home with vinyl siding definitely makes less work for you and anything that lessens the maintenance cost and time works for most people. If you are still debating on whether to install vinyl siding for your home, then knowing what the advantages of installing this siding are may help you to make an informed decision. Some people make decisions based on what their friends or family think but later regret them, and this is a rather big decision to make and it would be rather difficult to backtrack if you have made the wrong decision, so we will endeavour to assist you to make that decision more easily yourself. Durability – vinyl siding can last for a long time and stands up well to most weather conditions. Maintenance – The only regular maintenance vinyl siding needs is a wash-down about once a year. Cost Effective – it costs much less than having to repaint or repair wood on the exterior of your home. It can also reduce energy bills. Looks – it comes in many styles and a whole host of colours and the colour will look good for years. Severe Weather Conditions – the newer types of vinyl can withstand the harshest of weather conditions, including winds of up to 180 mph. Now that you have made your decision it is important that you ensure that you make use of a reputable manufacturing company so that you do not have problems with the product. Most manufacturers will not deal with you directly, but they will be able to refer you to a reputable company with which to deal. It is obviously also important that you find a manufacturer that is in your area. CertainTeed Vinyl Siding – have been in the home exterior field for more than 100 years. They also manufacture customs windows, pipe for home use and various other products. They have a great reputation for quality. Their vinyl siding lines are also eco-friendly. They are situated in Valley Forge, PA.
Garden State Brickface Windows & Siding – have been in the home exterior remodelling business in excess of 50 years. They are certified by the Vinyl Siding Institute and they have been awarded the Good Housekeeping Seal of Approval. They basically service the New York, New Jersey, Pennsylvania, and Connecticut areas and are based in Roselle, NJ. Hebron Brick Company – this North Dakota company was founded in 1904 and is renowned for providing a premium quality product. They offer a wide range of colours and also manufacture a lighter, thinner brick which can be installed anywhere. Their product is perfect for DIY. KP Building Products – this Holly Springs, Mississippi company provides top quality products and is also renowned for their excellent service. They manufacture a wide range of vinyl siding, from cost effective to premium product. Their products are tempered with top UV inhibitors, which prevent fading from the sun. Mastic Home Exteriors – are situated in Pittsburgh, PA and have been in business since 1932. Mastic was on e of the first companies to manufacture vinyl siding for your home as far back as 1959. They are part of the Alcoa Home Exteriors family since 1989 and offer one of the widest ranges of siding solutions on the market. There are many other vinyl siding manufacturers available, see our vinyl siding manufacturers page for more. The above companies are those which have been around the longest, which attests to the quality of their products and their service. Whatever company you decide to use, make sure that when you purchase vinyl siding for your home you use a reputable company.